In part 1 of this series we will look into the problem of energy costs in cold climates (in this case New Hampshire) and how a pellet stove can be used to reduce or eliminate that cost. When most people around the country think of New Hampshire, the first thing they usually think is “cold and snow”. And from October until May that’s a pretty accurate picture. It gets really cold – and really expensive. Of course when the temperature outside is about 25 degF or less, the floor tends to be quite a bit cooler than the chest high height where the thermostats are mounted. This necessitates sweaters and long sleeves. Not horrible, and we’re sure not wasting energy. I also have a wood stove in the cellar that heats the floor. Although a bit of a pain, it greatly reduces our oil usage on frigid days. 2010-11 $3,373.49 (oil price spike). As you can see, regardless of all the energy saving steps we have taken, we are still at the mercy of the volatile oil market. At the time that I write this residential home heating oil costs around $3.50/gal. We average about 200-300gal/month during the winter season, so I am looking at heating bills of $700-$1000/month during the 2011-12 season; $4000-$5000. I simply can’t afford that. Here is a chart of oil prices from 2000-2010. If the chart went to 2011 you would see another spike up to 350 (cents). I looked into every alternative energy technology I could think of; wind, solar; geothermal. They were all very expensive, achieved at best modest gains, were high maintenance, and the payback period varied from 15-30 years. As Dr. Evil would say; Riiiiiiight! True innovations come in surprising forms. At first glance, you may think that a modern pellet stove is the result of the availability of super-cheap microcontrollers. They allow the stove to increase and decrease the fire based on a combination of air flow and pellet feed rate. They also control a fan that blows through heating tubes to blast hot air into the room. Cool. But if you think about it, the true genius was the person who decided to take wood waste and transform it into a medium that could be conveniently delivered, doesn’t require chopping and splitting, and allows the homeowner to load a hopper every other day. Try doing that with logs! 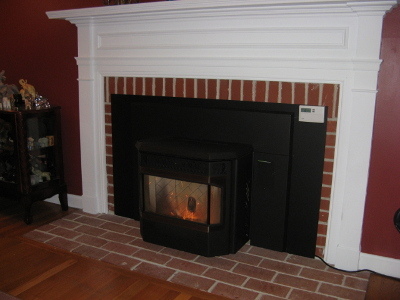 So after calling a number of vendors, I purchased a Regency Greenfire GFI55 insert for the fireplace in my living room from All Basics Stove Shop in Merrimack, NH. Short story; I love it. This stove is “smart” and runs great with a thermostat attached. 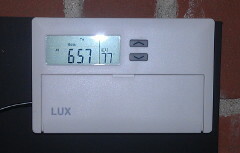 I connected a Lux TX500E, the same type of programmable thermostat that I use for my oil heat. This allows the pellet stove to fire up early in the morning and blast away for an hour, and then to lower itself to a comfortable temperature. Pellets are about $200-$250/ton, which is 50 40lb bags. A bag will last from 24-48 hours depending on how much the stove runs. Go to most homes where a pellet stove is installed and you see two common situations. Either they want to heat a lot of the house, so the room with the stove is 80+ degF and you want to take a swim. The other alternative is that the room with the pellet stove is the only comfortable place in the house. And that points to the pellet stove’s biggest shortcoming as a whole house heating system; airflow. What I really wanted was a way to distribute the pellet stove’s intense heat throughout the house. Depending on your home’s floor plan, strategic placement of the stove is essential. You want to install it in a room that is close to the center of the house. As it happens, my house has a perfect floor plan for a pellet stove. It is a traditional New England home of a type know as a “hip roof colonial”. Basically it is a two story cube with a central stairwell. I installed the pellet stove in the living room and then put a pedestal fan (so the blades are 4 feet high) in the doorway to blow the hot air into the middle of the house. The air rises to the second story and spreads through most the whole house. 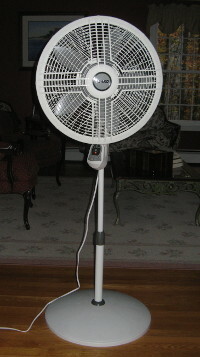 This is a Lasko 18″ 3 speed remote controlled fan for around $38 at Home Depot. So the concept works, but now the fan either has to run 24×7 or you have to constantly control it with the remote control. I wanted “set it and forget it”. 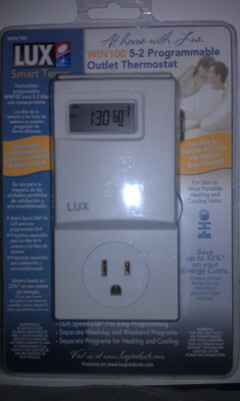 An easy way to automate a manual fan is to simply plug it into an outlet thermostat, like the Lux WIN100. Warning; if you decide to use this method do not buy a remote controlled fan! When a remote controlled fan is unplugged and then plugged in, it won’t come on until the power button is pressed, useless for control by an outlet thermostat which cuts and restores power to the plug. Instead get a simple fan like this instead. Ok, so now when the room heats up your outlet thermostat turns on the fan. This works quite well and is far more efficient than either heating the room to tropical temperatures or leaving a noisy fan running 24×7. At this point we’ve achieved “efficient”, but what if we want super-efficient, fully automatic, and Web control? Geek alert! Read on. The pellet stove has a microcontroller and a thermostat, why not the fan? As mentioned above, I bought a 3 speed, remote controlled fan. It’s not like I had a choice. I went to 2 Home Depots, a Lowes, and a Wal-Mart and it was the only pedestal fan left at any of those stores. Since I couldn’t use the outlet thermostat on a remote controlled fan, it looked like I was stuck. Nope. Being an inveterate tinkerer, about a year ago I asked my wife and daughter to buy me a microcontroller and network card to play with. For those of you who have never heard of “Arduino”, it is an open source, super cheap microcontroller with lots of variations and modules. I got a clone called a “Seeeduino” that costs $22. Arduinos have digital inputs and outputs as well as analog inputs. They can communicate with the world in a variety of ways. For more information, check out the project page. Turn the fan on and off when the room exceeded or fell below a set temperature. Increase and decrease the fan speed in steps as the room temperature rises and falls to disperse the heat throughout the house. Be able to override the controller without dealing with wall plugs. 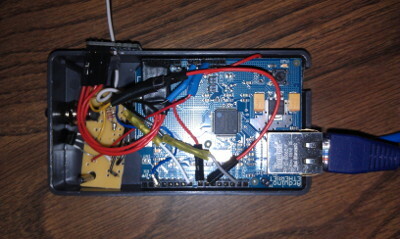 The result is a tiny box that controls the fan via it’s remote control codes. 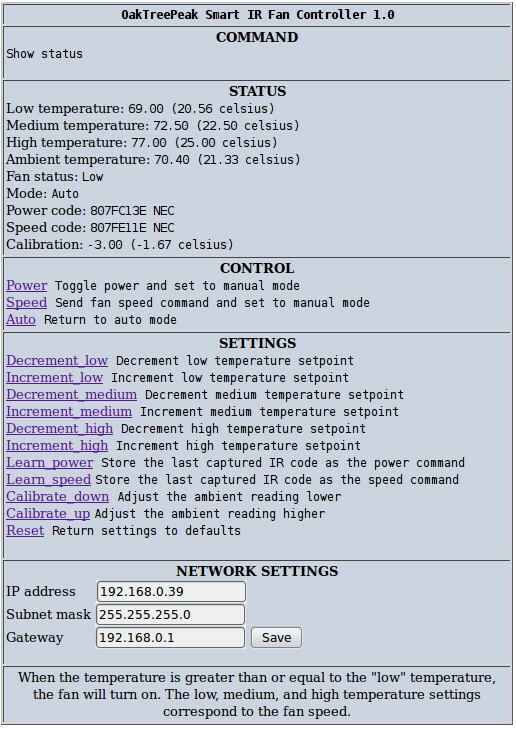 It has an embedded Web server and any household member can bring up the page and change the settings. It can learn the fan remote control codes by simply pointing the remote at the controller, pressing a button, and then clicking either “Learn Power” or “Learn Speed”. As you can see, it has three temperature settings which correspond to fan speeds of Low, Medium, and High. When the temperature falls below “Low”, it turns the fan off. The result is super efficient. The pellet stove thermostat is set to 77 degF early in the morning when the house is at its coldest. The fan slowly ramps up as the temperature in the living room increases and blasts hot air into the rest of the house. The thermostat then settles down to 68 at 7AM, which keeps the rest of the house at about 65. On weekends it is set for 74 during the day, which keeps the rest of the house at a comfy 70. In addition, my pellet use has been cut by around 30% as the fan works in perfect harmony with the stove to achieve peak efficiency. I estimate that I will go through a ton of pellets (50 bags) an average of every 70 days throughout the heating season. That totals 3 tons, possibly a bit more. I buy clean burning pellets which are a little more expensive at $250/ton, so my cost will be between $750-$1000 for the entire season. The oil heat has never fired up since I completed this system. We keep the oil heat thermostats at 62 so they will kick on if we are away from home for an extended period of time or if the stove were to have a problem. The pellet stove was $3500 installed. It will pay for itself in one heating season (with some pretty nice nights out to spare). Mission accomplished. In future articles, I’ll describe the hardware components, how I built the controller, and also discuss the software that I wrote to run it.